Elwha might actually get it's updated interior eh? It looks like Elwha's problems are perhaps worse than originally thought? Don't know if they anticipated the extent to which the steel has corroded, but a lot of money is being spent to keep this 50 year old ferry operational. 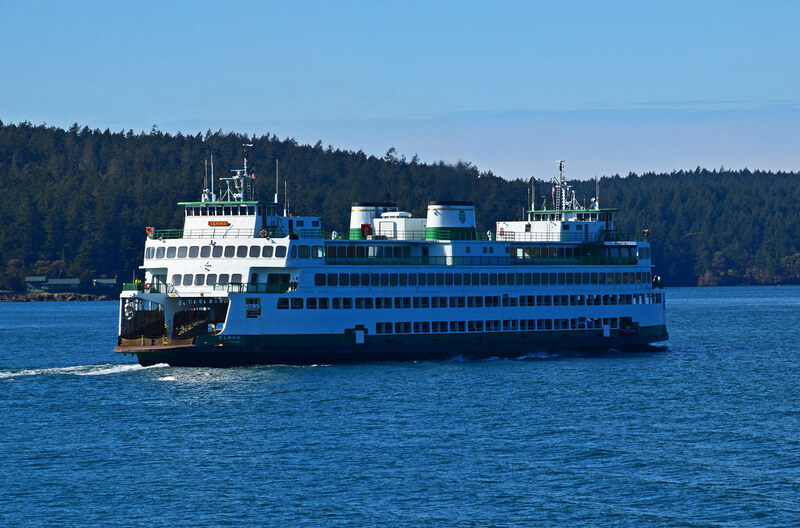 SEATTLE - The only international route for Washington State Ferries (WSF) has been temporarily halted. 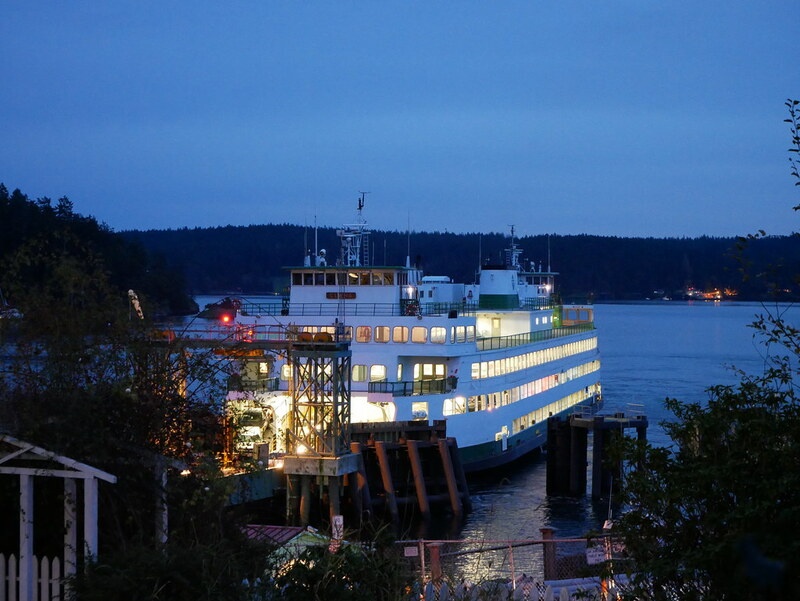 Passengers who plan to travel from Anacortes to Sidney, B.C. will need to find an alternative route. 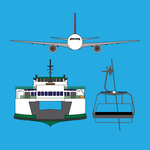 There are two Washington State ferries equipped for international waters that serve on the Sidney run: the MV Chelan and the MV Elwha. The Chelan has been temporarily moved to the San Juans to fill in for the Hyak while it’s out for repair. 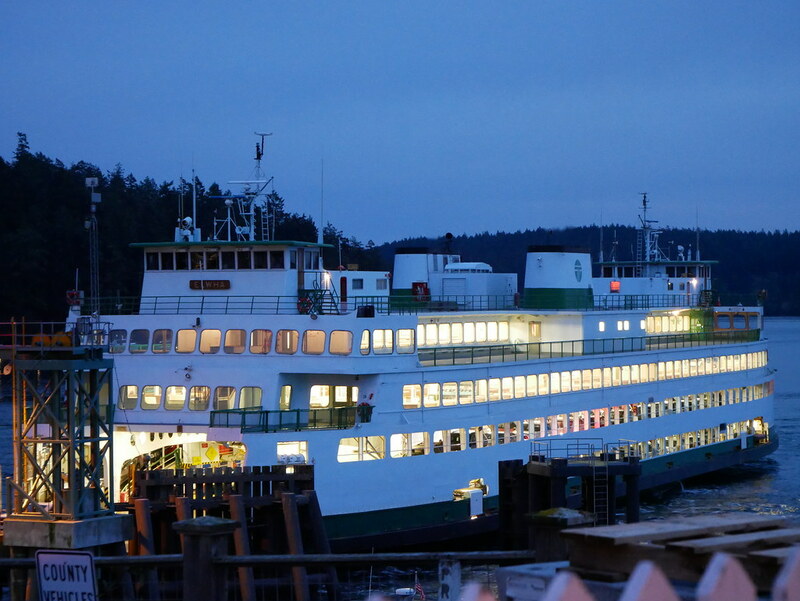 The Elwha has been at Vigor for significant work after a spring inspection found steel corrosion on the passenger deck. “We’ve replaced nearly the entire passenger deck, the number one and number two end, for a total of 12,000 square feet of steel plate,” said Jason Brown, a supervisor with Vigor. 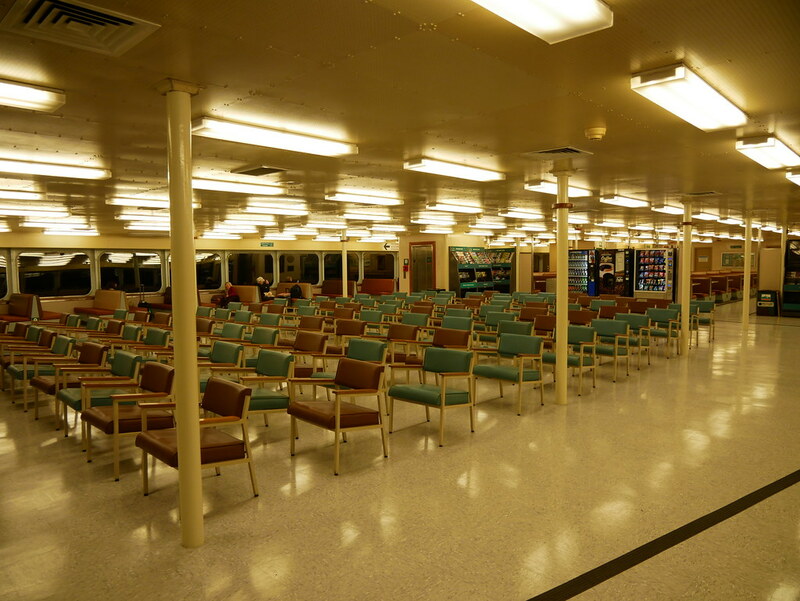 The 51-year-old ferry has been a work horse for the WSF system. Maintenance on the vessel is significant and pricey. “You’re basically restoring a vintage vessel to protect that international service, because we currently have no other vessels being built or in the pipeline,” said Ian Sterling, a WSF spokesperson. The restoration is costing taxpayers more than $20 million on a vessel that is due to retire in nice years. WSF said the life span of a vessel is about 60 years. 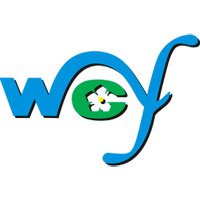 In a preliminary recommendation, WSF suggested a minimum of five additional Olympic-class vessels be built to replace the aging fleet. A decision that will be in the hands of taxpayers and lawmakers. But in the meantime, WSF said they have no choice but to spend millions on repairing their aging fleet. "Obviously we would much rather be putting the money into a brand new vessel,” said Sterling. 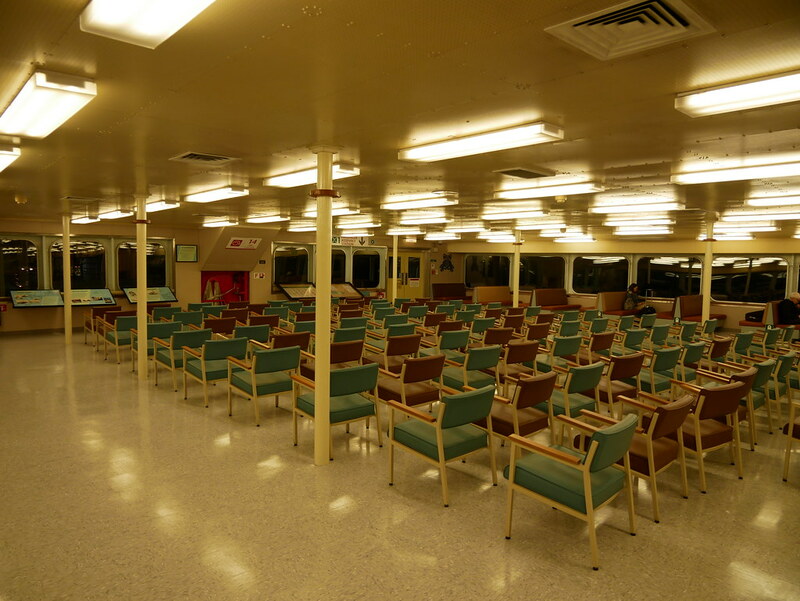 A new Olympic-class ferry runs around $125 million. WSF said they hope to return the Chelan to the Anacortes to Sidney, B.C. run by the weekend. 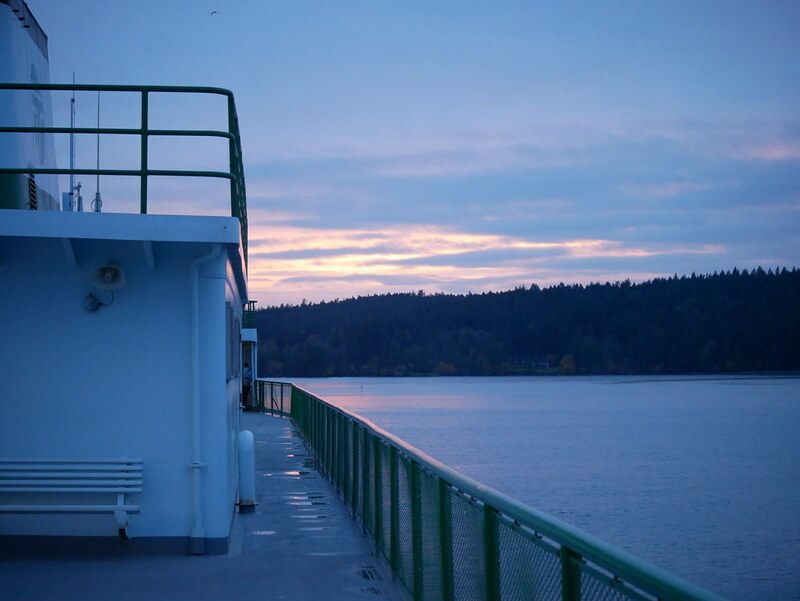 The Elwha will be back in service on the route around the end of November. Might it not be worthwhile for WSF, and BC Ferries, for that matter, to reconsider their notions about the lifespan of a ferry? $20 million for a boat that would have been long retired anywhere in Europe does not seem like a sane expenditure. Some firm in Ensenada will no doubt be happy to recycle all that fresh steel when she's broken up a few years from now. I agree, and I'm guessing management at WSF would agree, too. Now, it's getting legislature to agree. Sinking $20 million into a 51 year old vessel is crazy, but they don't have a lot of choice right now. Funding for the next series of newbuilds hasn't been approved or secured in any way. Even if Olympia was to do a quick session to approve funding for the next 4-5 ferries (not gonna happen), it will still be at least 2 to 3 years out before we see the first of those vessels built and in service. In the meantime, we still need to keep this aging fleet going. Going forward, I do hope the powers-that-be re-evaluate the lifespan of a vessel, as you suggested. 50 years should be the maximum. In the protected waters of Puget Sound, that might be achievable, but perhaps 40 years would be more realistic. 60 years is too long, although I gotta say, I think the Evergreens have held up better than the Supers. Tillikum is the only boat left in that class, but I think it may outlast Elwha and Hyak. At least new flooring. I wouldn't be surprised if they salvaged the benches and tables, and of course, those Eames chairs are easily removable. New flooring for sure, as they had to chisel out the concrete underlay to get to the steel. Or what was left of it. Everything else that was there is going to go back. The $20 million is the low ball figure. I'm hearing more like $25 million with estimates as high as $40 million due to the price of steel having gone through the roof because of recently implemented tariffs. I totally agree. They really need to not keep them beyond 50 years. This used to be the case for WSF when they were replacing ferries back in the 60s and 70s that they would retire them when they were between 40 and 50 years old (with the exception of the Chippewa, which they actually managed to get 64 years of life out of). Now, granted many of those were wooden ferries that simply didn't last as long as steel ferries, but still, you're barely going to get more than 50 years of life out of these ferries. And it's not surprising that a ferry like the Elwha would be in the worst shape, considering it's one of the Sidney ferries and the waters are a bit rougher out there. However, it's worth pointing out that WSF has to compete with all of WSDOT for funding for their projects, and our state's transportation budget is way lower than what it should be IMO, especially when it comes to road maintenance. Thus, it's not surprising that we end up with super old ferries when we can't even maintain our paved highways. It's really amazing that we have such poorly maintained roads despite the fact that WA has the second highest gas tax in the US. Thus, it's not surprising that we end up with super old ferries when we can't even maintain our paved highways. It's really amazing that we have such poorly maintained roads despite the fact that WA has the second highest gas tax in the US. California, with only a slightly lower gas tax and horrific road conditions (far worse than WA) says hello. Clearly tax revenue is not the only obstacle to transportation investment, as both states have plenty of it. Money has a way of disappearing mysteriously. Looks like the plan is to keep Elwha going until 2025. I wonder how much money will be put into her in the next 6 years. A couple of weeks ago, I got an opportunity to head up to the San Juan Islands. It was an amazing day- I rode 5 ferries and got to visit all four ferry-served islands. The impetus behind this trip was a chance to go for a ride on the new & improved Elwha. 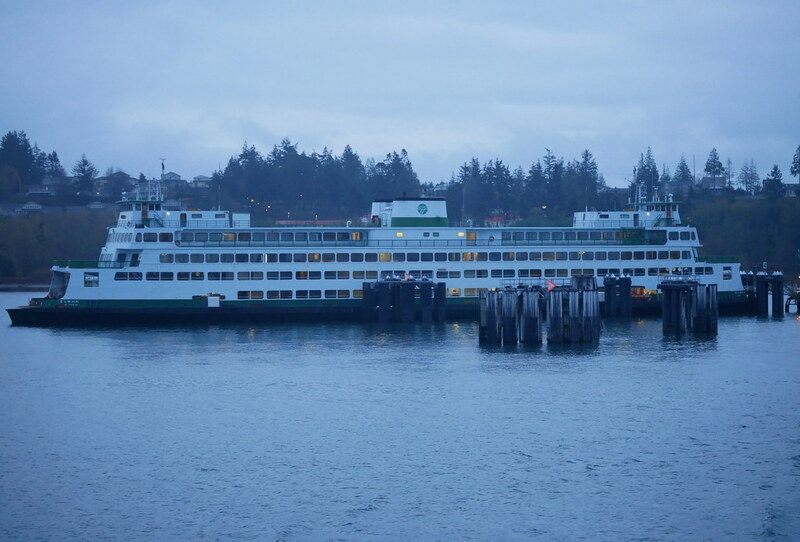 As I have stated before, the Elwha is my favorite ferry in the current fleet. I really missed her on my last two archipelago trips, and I wanted to see for myself how this run-in with corroded steel affected the boat. Fast-forward to nine hours later, and I'm on board the Elwha for her 3:40 sailing to Orcas as the sun begins to set. And, what everybody's been waiting for. As most of you probably already know, the reason the Elwha was stuck in drydock for so long was because of corroded steel in the car deck ceiling. Several thousand square feet of steel had to be cut out, requiring the removal of all of the flooring in the main cabin. 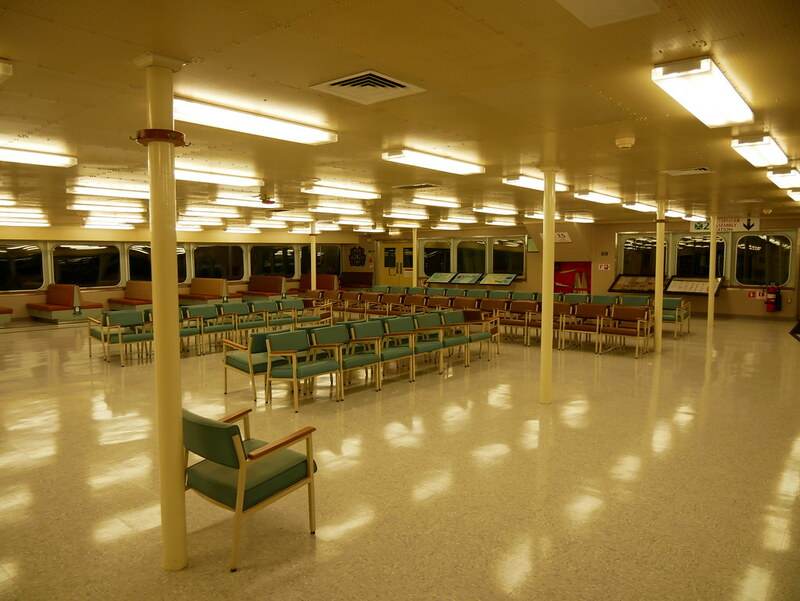 The new flooring looks pretty good in my opinion- certainly different than what previously existed on this boat. No. 2 End, with the chairs neatly arranged in color-coded rows. Another view of the No. 1 End. Evergreen Fleet has a before photo taken from pretty much this same vantage point. Looking towards the No. 1 End of the main cabin. Overall, the trip was terrific. It was an extremely successful, fun, and eventful adventure and there will be a full trip report written hopefully before the end of the month. It was good to get on the Elwha again, as well as the Hyak, Tillikum, Samish and Spokane. >Never, at any point during her time in the yard did a gold stripe get painted onto her funnel, much to my disappointment. >I didn't get any pictures of the car deck that are of quality worth sharing here. 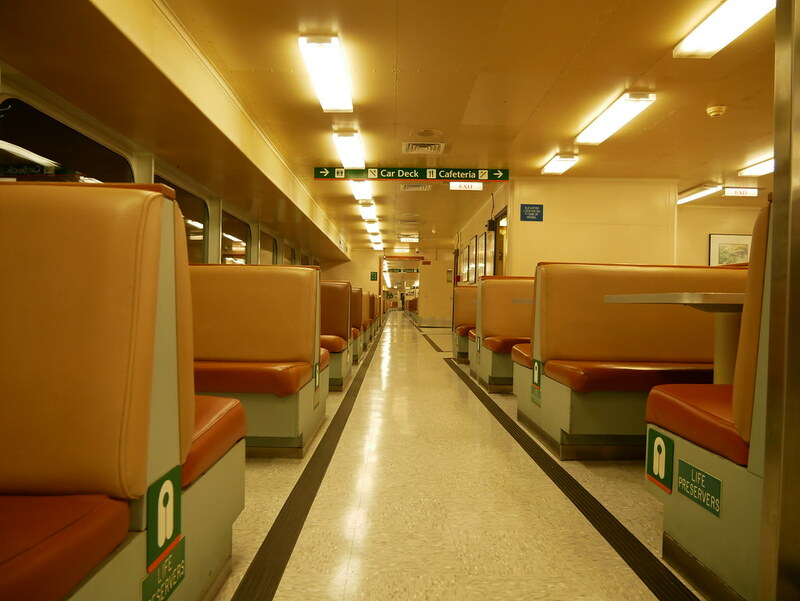 However, not much has changed: the car deck ceiling has that clean, shiny new look, however the rest of the car deck is more or less unchanged. >There were no observable changes made to the upper cabin during her yard time.